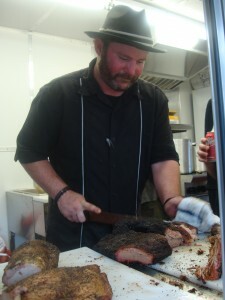 I wrote several articles last year during the run up to John Mueller re-entering the world of Texas barbecue. It was the biggest news story of the year in the world of Austin, Texas smoked meat. By the time Mueller got his food trailer up and running down in the Bouldin Creek neighborhood Austin eaters were foaming at the mouth. Veteran hounds wanted to see if he would be able to replicate the quality of the output from his days in the old brick and mortar restaurant on Manor Road while newcomers wondered what all the fuss was about. Mueller came out of the chute hard staking his claim to being the best barbecue in the state within weeks of opening. Soon enough, the lines came and now if you’re not queued up good and early chances are you’re simply not going to get fed. This entry was posted in Texas Barbecue, Texas Barbecue Photos and tagged Austin, barbecue, BBQ, best barbecue, Brisket, central Texas hot guts, Pork Ribs, Restaurant, Taylor Texas. Bookmark the permalink.